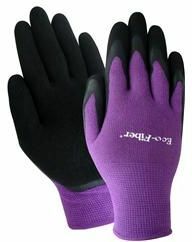 Earth friendly Eco-Fiber blue & purple bamboo knit liner, soft black foam natural rubber palm, Womens sizing. This product is available in multiple sizes and/or colors. See the table below for options.